Designs by Lisa Somerville: It's a Two-fer Kinda Day! It's a Two-fer Kinda Day! This weeks 3CTC comes from fellow Challenge Member Elena - Where are you from? Make a card that will represent city, state or country where you live. For example from Elena , I live in WI, so I can use cheese, mouse, cows images on my card. If you are from Florida you can make a card using Disney images. When I first read this weeks 3CTC, I said, HUH? Okay, that's why they call it a challenge...So I went to trusty google and searched for things about things that represent the State of Illinois, and stumbled across all of the symbols that the state is known for - whoo hooo now I have a jumping point. In case you didn't know, the state butterfly for Illinois is a Monarch. Using MJ's sketch (rotating and adding a few creative liberties) I incorporated the beautiful 3 Step Butterfly from Kitchen Sink Stamps using the Out of the Box Technique. 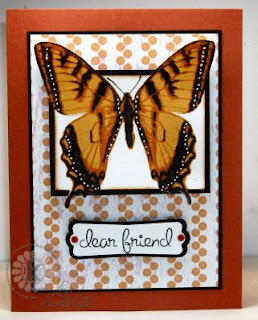 Stamping my butterfly in Mustard, Dusty Durango and Black inks, on White card stock, and added some white dots using my White Gel Pen. The sentiment is from Kitchen Sink Stamps 3 Step Hibiscus, stamped in Black on White card stock and punched with the new Modern Label Punch from Stampin' Up! The Black layer behind my sentiment was punched using the Big Shot and Stampin' Up! 's New Movers & Shapers Punch Window. I used the Double Circle Punch and Dusty Durango card stock for my Faux Brads, covering them using a Clear Gel Pen to give them the look of brads. Kitchen Sink Stamps annual "6 months before Christmas" 3 day SALE starts today, June 25th - Saturday, June 27th, 2009. Everything in the store will be 15% off when you use Promo Code HOLLY. If you happen to be reading this after the promotion, you can still save 10% on all your KSS purchases by using code LISA10KSS. Don't forget KSS also has some great stamps bundled for retirement. Thanks for stopping by, be sure to click on the Three Clovers Challenge logo on my sidebar to see what the other Challenge members created! i am so glad you participated in this challenge, Lisa! I didn't know that the symbol of IL is Monarch! That is so cool! WOW, I thought the butterfly was real. That is a beautiful card. Gorgeous! I wondered about why you chose a Butterfly and now I know. It does look like a "real" one and so very pretty. Lisa-this is ABSOLUTELY PULCHRITUDINOUS!!!! Stunning colors! wow...2 weeks in row that even Lisa has been challenged! Wow!! The butterfly looks so real, Lisa!! Absolutely beautiful!! OMG! I so want that stamp. How beautiful. I have yet to try their stamps but I always think they are so pretty. I think you put me over the edge with this one. I want that set! Your card is beautiful! And thanks for using my sketch. That butterfly is stunning!! I LOVE the whit dots, it really makes it pop! This challenge has been a history lesson as well as a geography lesson LOL! Lovely colors on this card! This is just beautiful!!! I love your butterfly and the gorgeous rich colours!! This is a gorgeous card. I have to admit, that when I look at your cards they always look so professionally done. marvelous coloring, and great to know about Illinois.